Recent moves by Katz360 and Triton Digital indicate that the streaming audio marketplace may be heating up, with new players signing up to have those firms sell their inventory. 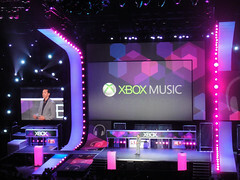 Triton Digital recently announced a big deal with Microsoft to sell audio ads on their Xbox Music streaming platform. Microsoft intends Xbox Music to be the platform that their customers use to listen to music, calling it a 30 million-song global catalog powered by the one service that integrates your music experiences across your tablet, PC, phone and tv. Triton Digital will sell ads and provide analytics for the service. Now, this is a big deal for Triton, one that could easily change the focus of their entire sales organization, not to mention the streaming audio marketplace, creating a lot more highly targetable inventory. At the same time, Katz360 is changing things up as well. First came the announcement that Brian Benedik was leaving, followed by an announcement that Mort Greenberg would be the new President. Greenberg, who was formerly head of sales at Nokia, apparently brought a deal to sell Nokia ad elements, and at least some of his sales team from Nokia, with him to Katz360. According to his Linkedin profile, the plan is to rebuild and rebrand this digital unit (Katz360) as a leading global local & location interactive ad Network and representation firm.